Dr. Austin O’Carroll discusses the role the arts can play in medical education, drawing on his experience as programme director of the North Dublin City GP training programme. Medicine has always vacillated between the two separate lovers, art and science. For much of the twentieth century there has been an apparent momentum promoting marriage between medicine and science and spurning art which reached its zenith with the emergence of the evidence-based movement in the late 1980s (1). This movement reasonably asserted that medical interventions are supported by reliable science-based evidence. However, the increasing interest in the arts in medicine has produced a counter-balance to this drive for evidence. The skill of reflectivity recognises that most practitioners work in the swampy, real world where patients do not come in like white lab rats with pure clinical pictures that allow our esteemed doctors to give a considered diagnosis and offer targeted evidence-based treatment. Carper (1978) devised a diagrammatic representation of the following ways of knowing: the ethical way which accounts for moral reasoning, the empiric way which accounts for evidence-based medicine, and the personal way which accounts for one’s own mental models, feelings, concerns, visions, attitudes and ignorance. 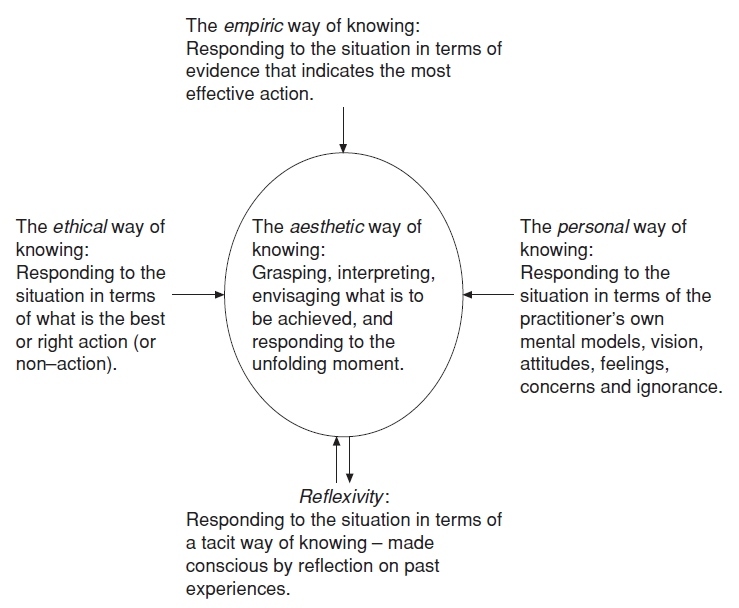 These ‘ways of knowing’ could be integrated using reflexivity in the ‘aesthetic’ way of knowing whereby the practitioner grasps, interprets and envisages what is to be achieved and responds to the unfolding moment. So how does this relate to how the arts can be used in medical education? The empiric way of knowing relates to the vast library of medical knowledge. In 2007 alone, it was estimated that 750,000 articles were indexed on Pubmed (a popular medical database). The arts have found some small niches in this way of knowing. For example, visual arts programmes have been used to improve students’ observational skills and knowledge of surface anatomy. The arts have gained a foothold in the Personal Ways of Knowing. Medical students have been found to be influenced by their ethical (or unethical) environment and role models. The undergraduate curriculum risks producing cynicism: a tendency to detach from patients, an acceptance of hierarchy and a loss of reflective ability. The arts can challenge this by contributing to the development of a more ethical, empathic and compassionate connection with patients by providing a non-medical lens through which students can engage with the world. I continue to marvel at how the same young doctors who will dispassionately present a real-life tragedy using a medical language and discourse that is devoid of human context, can sob in front of a good movie which allows them to enter the realm of feeling and empathy. Arts-based media can simulate life experiences where inner thoughts, feelings and dialogues are exposed and challenge viewers to engage on a reflective and human plane. In the context of medical students, who might be ‘cut off’ from their emotional experiences whilst in their professional role, integrating the arts into their training could result in the medical eyes being opened to the emotional and empathic aspects of their work. In the ethical realm, the use of the arts can encourage reflection by medical students on their perceptions of reality and society. The arts can challenge the medical canadian online pharmacy perspectiveand help students to develop a broader and more reflective outlook in the context of their attitudes towards their client group. This is particularly pertinent with regard to excluded and disempowered groups. The themes of prejudice, discrimination, inequality and disempowerment arise frequently in the arts and provide the educator with a platform from which to explore and challenge how medics respond to and create stigma. We use the arts in all three ways on the North Dublin City GP training programme (of which I am the founder and programme director) which has a mission to train GPs in providing quality care to communities living in areas of deprivation. Recently, we attended the play The Boys from Foley Street, a gripping lifelike depiction of how heroin ripped the inner Dublin city community apart. The play promoted a powerful discussion around the vision and mission of our training programme. Trainees said that the play inspired and motivated them to offer healthcare to such communities including those affected by heroin addiction. The screening of films such as Secrets and Lies, My Life as a Dog and The Hours on the GP training programme instigated discussions on themes such as family dynamics and their influence on illness; how young children can have their unhappiness pathologised into medical diagnoses; and how suicide may be seen as a viable option for an unhappy person. We encouraged students to engage reflexively both on what was happening with the characters in the films and their own feelings and reactions to those characters. We have also used Theatre of the Oppressed workshops to explore disempowerment and discrimination and to challenge trainees’ perspectives of the world. A creative approach is required for linking the empiric, ethical and personal ways of knowing into the aesthetic way. The creativity arises in that each new consultation is an unfolding drama that demands a flux of reflexivity based in knowledge, feelings and ethical sensibilities which flow and ebb in each separate moment. This challenge to the use of the arts in medical education from the evidence-based medicine perspective should be welcomed and encourage us to be more robust in establishing the benefits of arts-based education techniques in medical education. However, when going on the quest for ‘evidence’, it should be noted that behaviour change is notoriously difficult to demonstrate and ‘prove’, in particular when the change is attitudinal. For example, the evidence base in support of psychotherapy and counselling techniques remains decidedly shaky. Even more interestingly, the influence that drug companies have had on our supposedly objective evidence has been exposed (4). Thus, we need to challenge evidence-based practitioners to develop qualitative research approaches that are more attuned to the effects on attitude and behaviour rather than limit what can be known to what can be counted. In conclusion, we can understand the introduction of the arts into medical education as part of the educational response to acceptance of the psychological and social aspects of health. The arts are used in medical education to foster observational skills, improve the communicative and empathic skills of medical students, to help them develop critical thinking and to address negative and prejudicial attitudes towards disempowered communities and individuals. However, it is disappointing that despite the apparent benefits of arts-based educational programmes in medical training, the evidence for these programmes remains unproven, mainly due to inadequate research. So, could it be that medicine needs to expand the acceptable methods of research in order to understand the specific contributions of the arts to medical education? Dr Austin O’Carroll has worked as a GP in an inner-city practice since 1997. The Mountjoy Street Family Practice has a particular interest in providing primary care to excluded groups including homeless people, non-nationals and drug users. In 2007, he founded Safetynet, a networking organisation for health professionals providing primary care services to homeless people including a specialised methadone treatment programme. He established the North Dublin City GP training programme in 2009 which specialises in training GPs to work in areas of deprivation and with marginalised groups. 4 Goldacre, B. Bad Pharma: How Drug Companies Mislead Doctors and Harm Patients. 2012. London: Fourth Estate. Very interesting/informative article Austin and enjoyed it very much. I agree the arts play an important role in medicine teaching and practice. I just wonder however regarding the assertion that medical students have been found to be influenced by their ethical (or unethical) environment and role models…and that -The arts can challenge this by contributing to the development of a more ethical, empathic and compassionate connection with patients by providing a non-medical lens through which students can engage with the world. How are the arts ‘more ethical then the medical students – do the arts- in there various forms have better ethical training or we assuming they are more ethical people in general. This is not a criticism just a pondering! Also in medical school there are a lot of students with outside creative talents and maybe medicine should during medical school and formative years in training allow more time for these activities maybe formal arts teaching might not be needed.